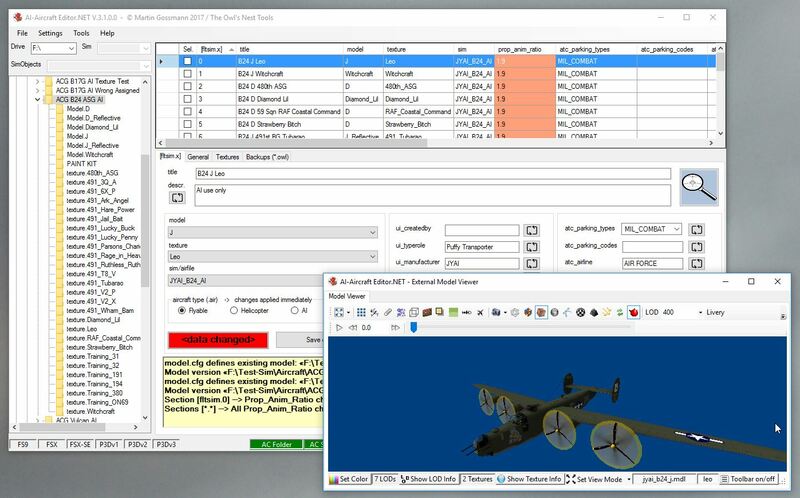 AI Aircraft Editor (AIAE) is a program for both aircraft developers and for people who like to add aircraft into their FS setup. It allows easy modification of the [fltsim.x] sections. You can check that the [fltsim.x] sequence is correct and re-number the sections in case it is not. AIAE allows to change the wingspan size for FS9 aircraft (in the model file) and for FSX aircraft (in the aircraft.cfg). A further feature is the detailed validation that you can run on a selected aircraft or all aircraft below a given root folder. The validations checks for missing and unused textures, models and air files, duplicate titles etc. The report is fully configurable and very fast. The last addition is the viewer component from Arno Gerretsen. Now you can see the visual representation of the aircraft. Thank you very much, Arno! Updated to newest version which includes aircraft validation.